Good To Begin Well, Better To End Well: Cait Greer talks GARGOYLES! This is our second post on Monsters of Myth. The first, by Diana Paz, covered the Snake Ladies of Classical Mythology. Today, we have Cait Greer to talk about one of the mythological monsters in her book, Para Wars: Uprising, the noble Gargoyle! I had the pleasure of reading an early version of this book, and let me tell you, the way Cait mixes her monsters is a LOT of fun. Gargoyles. Stone beasts built to guard. As far as the mythology behind them goes, there isn’t a lot to go on. Architecturally, the name refers to a grotesque, or a stone figure, with a carved spout. They were designed to carry rainwater away from masonry walls, keeping it from eroding the mortar. Boring, I know. But that’s hardly the whole story. It all goes back to a French legend, from around the 7th Century. The story is about a dragon, La Garouille, that lived in the River Seine. It terrorized the village of Rouen, until the Archbishop St. Romanus killed it. They set the dragon’s body on fire, but the head and neck survived, and were then mounted – you guessed it – on the wall of the newly built church, so that it could ward off evil. And the legend was born. 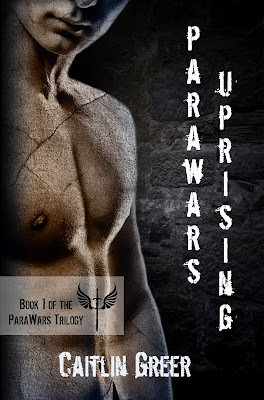 When I started writing ParaWars, I knew it would turn into my own little mythological playground. I didn’t want to focus on just one paranormal family, and I was just as tired of vampires and werewolves as everyone else. Angels, demons, and ghosts were quickly following in their footsteps. More than anything, I wanted something new, something I could have fun with. The broad scope the idea of a war between mythological/magical/paranormal/supernatural beings and humans gave me was exciting, but I still needed a para main character to counterpart my human MC. I wanted a guardian and protector, a para that wasn’t fighting his nature to protect my heroine. And what better than a gargoyle, whose entire mythology is built around protection and warding? But I didn’t want some clown- or demon-faced statue. I needed a guardian the story could sympathize with. So my gargoyles look a lot like us. They use the same kind of glamour magic that the fae use. They can look like the classic grotesque, or they can look like people. They can hide their wings, or show them. And at night, they change from stone to flesh. But even stone, my leading gargoyle Axel has a beating, bleeding heart, and I can’t wait for you all to meet him. The Paranormal Uprising brought myth and legend out of the shadows and into real life. The war that followed tore the world apart. Two years after the Uprising, twenty-year-old Kendry is learning the hard way that the battle lines aren’t as clear-cut as human versus para. And the hard way means being hunted down by both human militants and para separatists. Trouble is, she has no idea why. On the run with only her mysterious gargoyle guardian, Kendry knows that finding out why she’s on everyone’s most-wanted list will be no easy task. It means charging headlong into a war she’d hoped to avoid, and is woefully unprepared for. So when she realizes that everyone in her life has been lying to her, discovering that she’s somehow the key to ending the war is the last thing she needs. With both sides tearing up the world to find her, it’s decision time for Kendry—keep running, or stand up and fight. #ThorLove Bloghop Rafflecopter and PRIZE-talk! Fate of the Gods: Book Chick City Review Recap! FATE FORGOTTEN Bookmarks and Street Team Sign-up!